When people from Lumwira and Dzondi in Traditional Authority (T/A) Mazengera in Lilongwe District saw an Indian searching for gold in their area, they wasted no time but to join in the rush. “We didn’t know that all along we were sitting on gold. It was that Indian who woke us up from our slumber to join the mining industry,” says Misheck Chilayisoni, 40, from Mazengera. Before illegal mining started in the area, the people had no meaningful ways of generating income, they say. “As a father of three, I struggled to put food on the table. However, all this changed when gold was discovered in our area,” says James Makina. But their activities are illegal as they do not have mining licences. Notwithstanding this, however, illegal mining has spread like bushfire in the country. Now, it is not only Lilongwe District where illegal mining is depleting the precious minerals that if safeguarded, can potentially boost the country’s development. The rush for minerals is taking its toll in other districts such as Salima, Mangochi, Kasungu, Ntcheu and Neno. 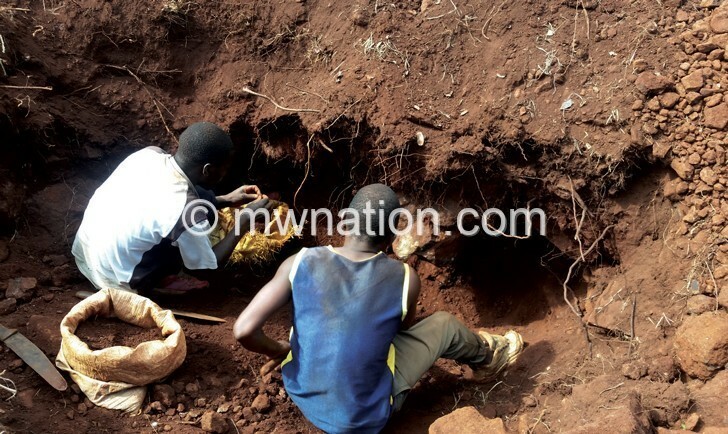 Two months ago, Malawi Defence Force (MDF) dispersed illegal gold-miners in Namizimu Forest in Makanjira, Mangochi District. People desperate to make ends meet have bought pieces of land containing gold deposits to mine gold. Chilayisoni bought a piece of land at K40 000 from a local where he eventually started mining. This escalation of illegal mining has jerked government into action with director of mining Jalf Salima saying government is doing everything possible to formalise the mining and trading in the gold. “We will conduct public awareness and eventually grant licences to people and evict the illegal miners,” says Salima. However, it has been difficult in recent years to regulate the mining industry as Malawi has been using a piece of legislation of 1981 which many argued it needed replacement with a new Act. And now, the New Mines and Mining Bill is set to be tabled during this sitting of Parliament. Yet, Chamber of Mines chairperson Dean Lungu observes that there are huge expectations from the new Act and opines that the country needs to develop a proper mining culture. “As a group of interested parties we believe the Bill has taken on board all sticky issues that were not addressed in the old Act. Certainly, the Bill is good for the mining sector,” he explains. This year, an overview of the Bill was financed by the World Bank under its Malawi Mining Governance and Growth Support project. But some stakeholders are grumbling about both contents of the Bill and the consultation process. Lungu says the mining companies welcome the prospect of tabling the Bill, but think the chamber has not been involved in any fresh consultations around it. “I think we are in a hurry. We are putting too much pressure on government and the investor. We need to slow down the expectation that mining will immediately change the economy. “We have a huge potential, but it’s important that investors should be given a good environment to operate in,” he says. A researcher with Tax Justice Network Africa, Rachel Etter-Phoya, argues that the Bill, while it addresses many previous concerns, has many gaps which are a concern for governance of the sector. In her analysis of the Bill, Etter-Phoya says the 1981 Bill is effectively being replaced by two separate proposed laws during the 2018 Parliamentary Session-an Amendment to the Taxation Act (already passed in 2016) and the new Mines and Minerals Bill. One of the changes to the Act is that there is a committee made up of principal secretaries or delegated representatives from various government ministries and departments, including Mining (the chair), Water, Environment, Lands, Treasury, Parks and Wildlife, Economic Planning and Development, Geological Survey and Forestry, and the Inspector General (IG)of Police. Despite this, however, Etter-Phoya explains that there are a number of cases such as awarding of licences and contracts as the case in the petroleum sector and in the past making strong evidence of political and corporate interference in the process. “This creates an unlevelled playing field for businesses and jeopardises the contribution of the sector to Malawi’s sustainable development,” she says. Another shortfall as pointed out by experts is that the proposed new law falls short of providing room for members of the public to access such information and does not make mandatory the release of contracts and licences to the public. Malawi joined the Extractive Industries Transparency Initiative (EITI) in 2015 and is currently undergoing validation. Through EITI, Malawi has voluntarily disclosed all contracts in the mining sector. Natural Resources Justice Network (NRJN) chairperson Kossam Munthali, representing leading civil society organisations (CSOs) in the extractive sector, explains that a clause should be inserted into the Bill to ensure contract disclosure continues. “The Bill, to effectively end corruption in the sector, must further be explicit on allowing the public to access contracts and licences including where and how such information can be accessed by the public,” he says.